U.S. capital markets are crucial to fueling the economy, providing 67% of funding for economic activity and facilitating the transfer of funds from those who seek a return on their assets to those who need capital and credit to grow. 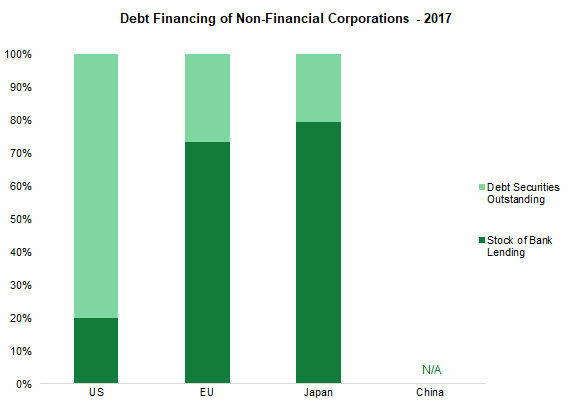 Capital markets enable debt issuance, which is a more efficient and stable form of borrowing for corporations. 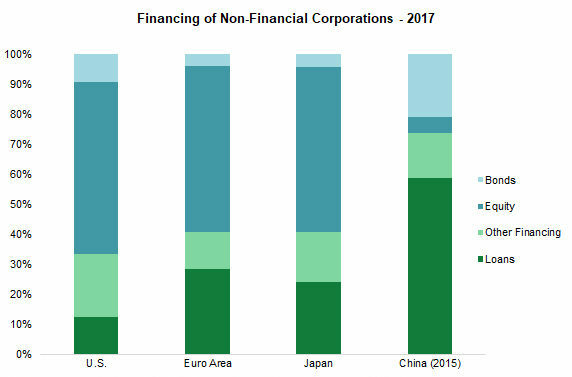 The use of debt capital markets is more prevalent in the U.S., with around 80% of corporate funding coming through the debt capital markets versus 20% bank lending. This is reversed in other major developed and emerging markets. Bank lending can be more cyclical in nature and is, therefore, more prone to disappear during economic or market shocks. The capital markets component of our financial system is an important source of strength for the U.S. economy. A diverse mix of financial institutions is critical to maintaining the competitiveness and strength of U.S. markets. This enables the group as a whole to provide balance sheet capacity in the form of a wide array of financial products for corporate, government and retail customers. U.S. customers benefit from the opportunity to engage in a multitude of financial transactions to support their needs. Foreign banking organizations (FBOs) are a critical part of this diversity and support the depth and competitiveness of U.S. markets, as well as provide access to international markets. There are 12 global investment banks which facilitate the vast majority of trading activities (both FICC and equities) and execute a high proportion of issuance transactions (equity and debt) and M&A deals. In the Americas region, 6 of these firms are FBOs (50%). On a global basis, we estimate the largest foreign firms represent over 1/3 of global trading in both equities and FICC and 27% in investment banking. Additionally, FBOs represent 65% of primary dealers and 49% of registered swap dealers, crucial to running U.S. monetary policy and helping corporations manage risk. Yet, FBO market share declined from FY14: equities -8%; FICC -3%, IBD -5%. Unfortunately, post-crisis regulations have discouraged FBOs from participating in many segments of U.S. capital markets. Many FBOs are subject to enhanced capital and liquidity requirements at the U.S. subsidiary level, despite already being regulated and capitalized at the parent level (under accepted international banking standards), inclusive of U.S. operations. 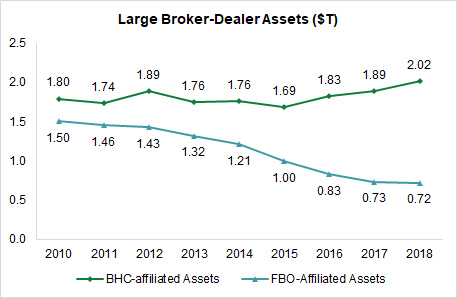 As a result, while FBO-owned broker-dealers have historically provided a major share of U.S. capital markets capability – 45% of balance sheet capacity for the system and 34% of the top 10 fee revenues generated from underwriting and advisory work (in 2010) – FBO assets have shrunk dramatically since 2010. FBO total assets declined 52% over the last eight years – a dramatic shock to a core source of funding in the U.S. – and FBO market share in investment banking activities (bond issuance, loan origination) is down by essentially one-third, to 24% of top 10 fee revenues. This shrinking trajectory coincides with significant new regulations adopted in the early 2010s (on top of capital requirements in their home markets), including the Dodd-Frank Act and Internal Holding Company (IHC) requirements. As noted in the 2017 U.S. Treasury report, requiring capital and liquidity at the IHC1 level results in regulatory requirements that often exceed what would be required if the U.S. activities were treated as part of the IHC’s consolidated parent. Yet, these firms are subject to additional regulatory burdens at the IHC level under U.S. enhanced prudential requirements2. It is inappropriate to apply standards developed for a total global firm to a regional subsidiary. It is an apples-to-oranges comparison. Global firms are already subject to enhanced standards at the global level, and the U.S. has a longstanding tradition of national treatment that acknowledges and respects equivalent home country regulation. It also contradicts a goal of the Basel committee for coherent implementation of policies to create a level playing field across countries and regions, i.e. no ring fencing or gold plating. This approach also increases the risk of regulatory balkanization. If a leading country like the U.S. is seen to punish foreign banks, other countries may respond by limiting foreign bank operations in their jurisdiction. This can have the undesired effect of actually increasing risk in the total global financial system. For example3, ring fencing traps capital in one local subsidiary, which decreases resources available for other subsidiaries. If other countries implement their own ring fencing policies, the benefit of global diversification is lost. New FBO branch proposals could increase the probability U.S. firms will face quid-pro-quo regulations on their operations in foreign jurisdictions, similar to what FBOs have experienced in the U.S.
Market participants note concern that the decline in FBO participation – at a time when U.S. firms are constrained by the same regulations and therefore limited in how much new business they can take up – decreases the diversity of business models participating in U.S. markets. This could negatively impact the efficient functioning of U.S. capital markets, i.e. provision of liquidity, under times of market stress. This could reduce the resilience of the U.S. financial system and unduly harm the U.S. economy. Foreign Banking Organizations (FBOs) are key participants in the U.S. capital markets across all asset classes and activities. For example, FBOs comprise 65% primary dealers and 49% of swap dealers. FBOs are crucial to the U.S. markets’ smooth and efficient operation, however, the speed and extent to which FBOs have deliberately shrunk market share could have longer term impacts. Between 2014 and 2018, FBO market share declined across all product types – Equities ( -8.2%), FICC ( -3.0%), IBD (-5%) – with one of the largest FBO broker-dealers reporting a decrease in assets of 52% between 2010 and 2018. The decline in market share appears correlated with the implementation of the Enhanced Prudential Standards, including the requirement to form an Intermediate Holding Company and the application of capital, stress testing and liquidity rules. There is no indication that the decline will abate, as costs of compliance and capital charges are considerable. The implication to market efficiency and stability is questionable if current trends continue. Conclusion: Applying global regulatory standards to U.S. footprints has caused FBOs to exit businesses, which could have long-term adverse effects on markets and the economy. These actions could also become global, opening U.S. firms to quid-pro-quo regulations on their operations in foreign jurisdictions.